South''s captain Ben Staley heads towards back-to-back centuries in last weekend''s game against RSL. 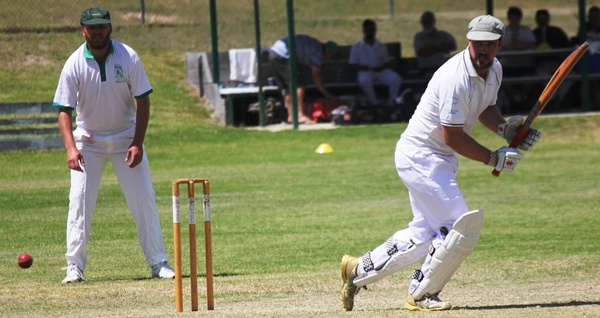 South’s continue build moment in the Stanthorpe Cricket competition after their slow start to the season. In Saturday’s game they posted a big win over rivals RSL. In the game played on Sheehan Oval South’s batted first and Ben Staley had a field day posting his second century in as many weeks. His 106 coming off just 115 deliveries and included nine boundaries and a couple of sixes. After Staley’s opening partner Singh was returned to the clubhouse midway through the second over Mark Lanza came to the wicket. Lanza turned back the clock with a trademark Bluey Lanza innings of 81 not out. The pair put on a third wicket partnership of 162 before Staley was caught by Sam Dowie off the bowling of Anthony di Bella in the 36th over. Unfortunately the horse had bolted and at the end of the innings RSL were looking for at a target of 249. The RSL innings began slowly with the South’s opening bowlers pinning the batsmen down early. The South’s bowlers did a great job and the RSL innings failed to gain traction. Liam Lanza cut a swathe through the batsmen taking five wickets for 12 runs from five overs. His spell included one maiden. The normally solid RSL batting line up capitulated with no batsmen reaching 20. They were dismissed in just the 28th over for 97.